The 2017 Ford Raptor has stepped its game up with more ground clearance than ever before. To handle power distribution between the front and back wheels, which is no small feat where the Raptor is concerned, 2017 sees Ford’s high-performance truck getting an all-new 4-wheel drive, torque on demand transfer case. The engineers at Ford have done it again; the Raptor’s 3.5-liter EcoBoost engine with direct fuel injection is even more powerful than the previous 6.2-liter V8 – Ford’s EcoBoost F150 will have the most torque in its class – the Raptor will ratchet that number up, packing 450 horsepower and 510 lb.-ft. of torque. The Raptor’s military-grade aluminum body lets it look more aggressive, stylish, and substantial than ever while shedding more than 500 pounds from its predecessor! 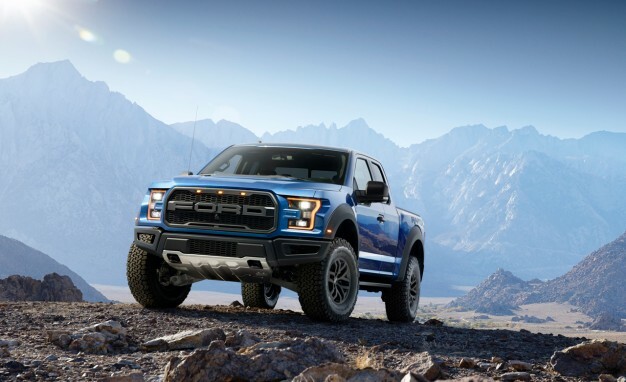 That weight loss adds up to a 15% improvement to the Raptor’s power-to-weight ratio – a difference you’ll feel on highways, byways, and everywhere in between. A true original from head to toe, the 2017 Raptor features exclusive 2nd-generation BF Goodrich K02 tires. These next-generation all-terrain tires, which come standard on the new Raptor, feature the latest enhancement in tread and architecture to deliver better ride quality, off-road traction and reduced road noise. The Raptor has improved suspension travel for 2017, meaning you can hit the trail with even more confidence. When it comes to off-road driving, suspension travel is king. The most optimal truck in the world is now better than ever at optimizing itself to meet your needs. The 2017 Ford Raptor’s all-new Terrain Management System comes with 6 preset driving modes to handle whatever you can throw at it: Normal, Sport, Weather, Mud/Sand, Baja, and Rock/Crawl. The all-new 2017 Ford F-150 Raptors are rolling into Butler Ford, and if you want an opportunity to own the best-performing, most-capable, military-grade machine every built, you’ll need to act fast! From its instantly-recognizable grille to its howling true dual exhaust, this legendary predator is tuned to be the best Raptor yet, on the road and off it – and that’s saying a lot! For ordering information, contact Butler Ford at (541) 482-2521 or via email at customersfirst@butlerman.com.